A thought to begin with: when dealing with given ranges, these are always to be taken with a grain of salt, as at maximum range the lower altitudes are most likely not seen on radar, while the higher altitudes require a longer traveling distance due to the added vertical distance. Still, SAM’s does two things: 1) they kill stuff, and, 2) they force aircraft to adjust their tactics, i.e. fly lower, carry less ordnance, spend time searching for the enemy anti-air batteries, and so forth. This means that even if no kills are scored, their presence alone might mean that they are doing their job. The new SM-6 provides the long-range anti-air cover for the US Navy, as well for a number of close US allies in the Pacific area. It has a range of roughly 240 km. 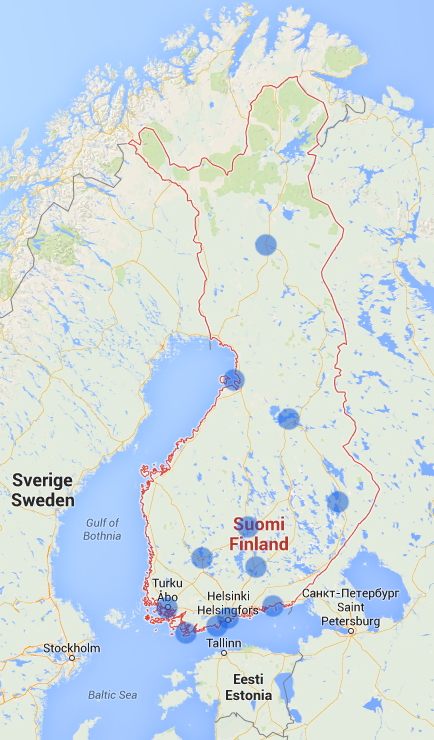 Above is a picture showing four batteries grouped in Hanko, Joensuu, Kajaani, and Rovaniemi. 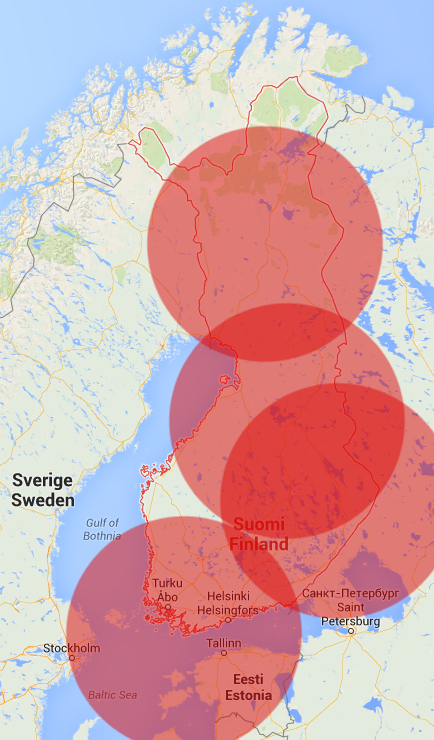 They cover the better part of Finnish airspace, as well as quite a bit of Estonia’s and some Russian and Latvian too. The downside: they have a fly-away cost of 3,5 million Euros per missile. I haven’t found the cost for a ground-based launcher, but from the French numbers for the SAMP/T, 10 launchers + 575 Aster 30/15 missiles cost 4,1 billion Euros, we can make a rough estimate that its launchers cost around 300 million Euros per battery, with the SM-6 probably not cheaper. The SM-6 would force enemy aircraft down to lower altitudes, were a system such as the ASTER or the NASAMS 2 (known as ItO 12 in Finnish service) could then shoot them down. The NASAMS 2 have a maximum range of around 15-20 km, of which Finland currently operates 24 firing units bought for 366 million Euros. To this, the cost of missiles will have to be added, and these comes in at a price of 1,45 million Euros each. The firing units can then be networked into batteries, so the total number of batteries is harder to give, but a quick look at the map says that around 12 batteries would be needed to protect key cities, harbours, and the four SM-6 batteries. To this would then have to be added the number of batteries needed to protect the major military units out in the field, as well as some key points in the direction of the battlefield, such as railway lines and bridges. To these then comes the short-ranged shoulder launched missiles. Stinger missiles for everybody, right? Well, the latest deal included ‘hundreds’ of missiles which Finland bought from ex-US Army stocks, for the price of 90 million Euros. However, for new missiles the price is quite something else, as the earlier Finnish request for 600 Stinger FIM-92C RMP missiles with related equipment and support showed. This whole deal was valued at 265 million Euros, or 440 000 per missile. The estimated 6 billion Euro program for replacing the Hornets with new fighters suddenly doesn’t look as expensive as it used to. We could buy the French SAMP/T-package with ten batteries and a few hundred missiles, and to this then add 1500-2000 Stinger missiles, for a grand total of around 5 billion Euros. We’d then have approximately 1 billion Euro left to buy a handful of cheap fighters for QRA, as well as cruise missiles and recce UAV’s to be able to attack pinpoint targets deep behind enemy lines, by which time we would be in a rather tight spot not go over the original cost. Naturally, this is a thought experiment simplified to the extreme. The need for anti-air missiles or unmanned reconnaissance vehicles does not go away if we acquire a new fighter. It can also be debated whether ten SAMP/T really would provide the same level of protection that the more mobile fighters would. A third argument is the difference in life-cycle costs in peacetime, training flights with fighters are extremely expensive compared to a SAM-battery driving out into the woods and setting up camp for a week or two. Still, even this basic calculation shows the simple fact that SAM’s are not the dirt cheap solution to our air defence needs they sometimes are portrayed to be. Thanks for the article. Even though you make the point, I think the rough estimates of cost comparison are not close to correct. Firstly, the cost of replacing Hornets is going to be much higher than the political figure of 6 Mrd that clearly is not going to hold, or could only include relatively small amount of a cheaper plane, i.e. Gripen E/F without training, parts and weapons. Using figures from public contracts and reports including Norvegian F-35 -and Brazilian Gripen contracts: 40 F-35 A’s initial purchase would cost around 13 Mrd including everything, and around 18 Mrd during lifecycle. The respective costs for 60 Gripen E/F’s would be around 8 Mrd and 11 Mrd, to give a more realistic estimate. Secondly, you don’t mention that Nasams and part of the Stinger figures you state are already paid or in the budget, whereas fighters aren’t, and whether they can be even fit there is a serious question. Thirdly, limited amount of long-range SAM would also provide a vital defence (that we don’t have) for strategic targets against shorter range ballistic missiles, and no fighters can’t provide. A good situation would be acheived by three (not four) batteries scattered in 1: Kirkkonummi-Tuusula-Hki-area, giving ballistic protection for Helsinki Area, Upinniemi and Inkoo LNG-terminal etc. 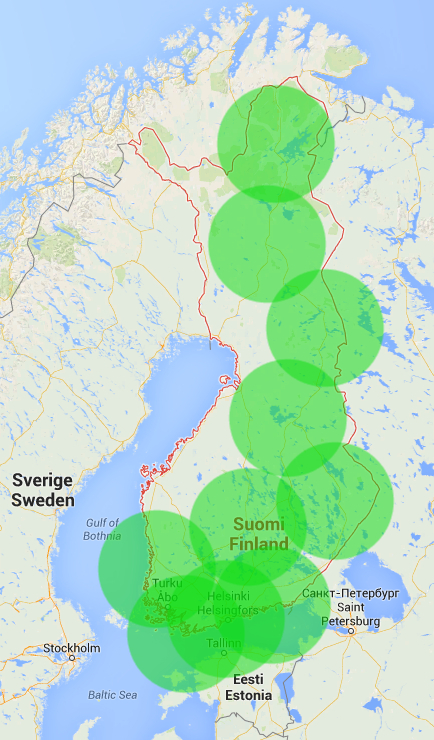 2) Around Kuopio, ballistic protection for Rissala, and 3) Rovaniemi. These locations would pretty much also cover the whole eastern border, even if instead of SM-6, a somewhat cheaper PAC2/3 would be used. SAM is a lot cheaper than fighters if you want to compare even though some fighters and JASSM’s are of course needed. And I couldn’t agree more with the earlier post that the fighters lives would be short and restricted if a war agains Russia unless we could use Swedish bases (or have Nato support as a member). The final cost of the HX-fighter program remains open, and it seems plausible that we won’t be able to keep it under 6 Mrd Euros, but on the other hand, the preliminary value quoted for the Brazilian Gripen-deal is 3,6 Mrd Euros for 36 planes and some kinds of undisclosed support, which if we extrapolate would give around 60 planes at 6 Mrd. There is no way this will fit in the ordinary budget, which also seems to have been accepted by the leading political parties, both in the current government and in the opposition. What remains to be seen is how much extra will be allocated for this deal. Yes, we do currently have a very basic air defence network, which is paid for through normal budget funding. However, as can easily be seen by the visualization of the coverage compared to the number of current NASAMS launchers, we would need to expand upon this number with at least a doubling if we want to be able to protect both key areas, such as cities, bases and traffic lanes, as well as major army units, which really would need at least two batteries per unit to be able to leap-frog when moving with one battery constantly operational. Other alternative is to bring in a mobile AAA/SAM-system in greater numbers, but then the range tends to suffer. The theater ballistic missile defence, in practice protection against Iskander-missiles, is definitely a feature that would be appreciated, and something that was looked into and decided to be too expensive when the NASAMS was chosen over the SAMP/T. Whether it was the right choice is hard to say, I personally feel that employing the same widely used missile for both air-to-air and surface-to-air work is a bit dangerous, but then again, unlike the committee which recommended NASAMS, I am no expert on SAM’s. The main problems with surface based systems are their need for constant radar emitting, which gives away their location, and makes them relatively easy to find. The alternative is to keep moving, which is a cumbersome process for larger systems, and means that during the move the systems are off-line. As said, with an integrated network with multiple overlapping systems, this can be achieved, but then we are back to a large number of systems with corresponding heavy costs. Of course, fighters are tied to their bases, and these are even more rigid than SAM-sites. In the end, I find it hard to believe that either SAM’s or fighters would be able to survive without the cover of each other. As such, the whole question is not one of “either – or”, but of “how much of each”. As usual there are some contradicting figures, and comparing different contracts is not straightforward. According to for example: http://en.wikipedia.org/wiki/Saab_JAS_39_Gripen#Potential_and_future_operators , and http://www.defenseindustrydaily.com/brazil-embarking-upon-f-x2-fighter-program-04179/#2014: Oct 24/14: Brazil. Saab signs a $5.475 billion contract with Brazil’s COMAER for 28 JAS-39E and 8 JAS-39F fighters, alongside provisions for training, initial spares, and a 10-year Industrial Co-operation contract to transfer technologies to Brazilian industry. Wikipedia inlcudes maintenance agreenment, without details. Deducting from 5,5 Mrd $ (4,4 Mrd€, not 3,6 Mrd) we get 7,4 Mrd for 60 planes, around to 8 Mrd with weapons just for the initial purchase. I am however not qualified to assess all the variables in a this complex contract with political and economical haggling. If someone has better knowledge I am interested. The money clearly is going to come from outside normal military budget. Also there should be added financing now, trickles starting from 2016 is a huge risk with aggressive and potentially destabilizing Russia and their ability to use force with very short notice. A good start would be to speed up upgrades and acquirement of current systems, and ordering long range (ballistic capable) SAM, starting with Helsinki area, with option for additional batteries that could be decided when deciding about coming fighters. Otherwise I totally agree with your reply. Then there is the question whether Hornet is any deterrence against the latest Fulcrum models, (definately not against hi-lo mix of T-50 and them in the 2020’s) and how much 60 Gripen E/F’s or 40 JSF:s would be without strong layered SAM and/or Nato capabilities. The downside: they have a fly-away cost of 3,5 million Euros per missile. I haven’t found the cost for a ground-based launcher, but from the French numbers for the SAMP/T, 10 launchers + 575 Aster 30/15 missiles cost 4,1 billion Euros, we can make a rough estimate that its launchers cost around 300 million Euros per battery, with the SM-6 probably not cheaper. Not 30 million Euros per battery? The total program cost for the French FSAF-program is around 4 billion euro, I can’t track down the 4.1 which I used back when I wrote this post, but e.g. this (http://www.senat.fr/basile/visio.do?id=d149483-85853_13&idtable=d149483-85853_13&_c=fsaf&rch=ds&de=20151009&au=20161009&dp=1+an&radio=dp&aff=49483&tri=p&off=0&afd=ppr&afd=ppl&afd=pjl&afd=cvn#eltSign4) official budget document gives the FSAF cost at ~4.0 billion back in 2014 (of which 3.3 already had been spent and rest was to go out over the coming years). Now, there is some uncertainty as to whether the marine version (SAAM-FR) is included or not, and as some support and R&D costs are included, a straight 3 billion for SAMP/T divided by 10 batteries = 300 million/battery probably is too high. However, there’s no denying that the system is expensive (the so called ‘Phase 3’ of the program, which is the latest upgrades, full production and common FSAF/PAAMS Aster munition production, alone weighs in at over 2 billion euro for all partners combined), and it should be remembered that a battery consists of a large number of vehicles (four TELs armed with up to eight missiles, a Thales Arabel X-band radar, a command and control vehicle, as well as numerous support vehicles), so the 34 million is certainly too low for the battery as a whole. Erittäin hyvä, avaava ja kysymyksiä herättävä blogi. Erityisesti nuo kartta esitykset kertovat enemmän kuin 2000 sanaa. Israelille ilmatorjunta ja erityisesti ballististenohjusten torjunta on elämän ja kuoleman kysymys. Suomen asema on vähintään kaksi kertaa hankalampi. Eli meillekin elämän ja kuoleman kysymys. Voi aiheellisesti kysyä, oliko NASAMS 2 oikea ilmatorjuntajärjestelmä Suomelle? Pystyulottovuus/kantama 10/22km, kaikki Venäjän taistelu/pommikoneet pystyvät lentämään tuon yli. Ballististenohjusten (es.Iskader) torjunta kykyä ei ole. Olisiko ollut vaihtoehtoja tälle “kaupalle”? Olisi ollut useita ja huomattavasti tehokkaampia. Sanoisin että kahdesta vaihtoehdoista, Volvo ja 2 Ladaa, valittiin 2 Ladaa. Ilmavoimien ja pääesikunnan vaatimuksesta. Suomelta puuttuu pitkäjännitteinen ilmatorjunta/ohjusilmapuolustuksen/ballististenohjusten torjunta ohjelma/suunnitelma. Tämän ohjelman puute on vastuuton ja hengenvaarallinen itsenäiselle Suomelle. 2008: 6 patteria SPYDER-MR 16/50km 384 ohjusta 390 milj€. 2 Hämeenlinna/Helsinki, 1 Karjalanprikaati, 1 Porinprikaati ja 2 Rovaniemi/Kainuunprikaati. Suomen päällä olisi nyt “teräskupoli”. Tämä järjestelmä kokonaisuus pystyy teoriassa tuhoamaan kaiken ilmassa tulevan! Asia joka häiritsee minua eniten on USA:n alkuperäinen “NASAMS” ilmatorjuntajärjestelmä jota kutsutaan HUMRAAM:iksi jossa käytetään ohjusta nimeltä SL-AMRAAM 15/33km. Suomen NASAMA 2:ssa käytetään AIM-120C7:ää 10/22km. Voisiko joku oikaista tämän “väärinkäsitykseni”. Eli, vaikka yritän olla hirvittävän optimistinen ja sulkea epäilyt pois, joku mättää, ja pahasti! Jokainen varmaan ymmärtää miten Suomen asema muuttuisi jos meitä ei voisi uhata ballistisilla- ja risteilyohjuksilla. En ole ottanut tähän vertailuun USA:n tuotteita koska muut hoitakoot ne. Suomen BUK-ilmatorjuntajärjestelmä olisi ollut päivitettävissä ja “modifioitavissa” kiinalaisten avulla ja kiinalaisilla ohjuksilla nyky vaatimuksien mukaiseksi. Vaikka vara/lisä suojaksi.